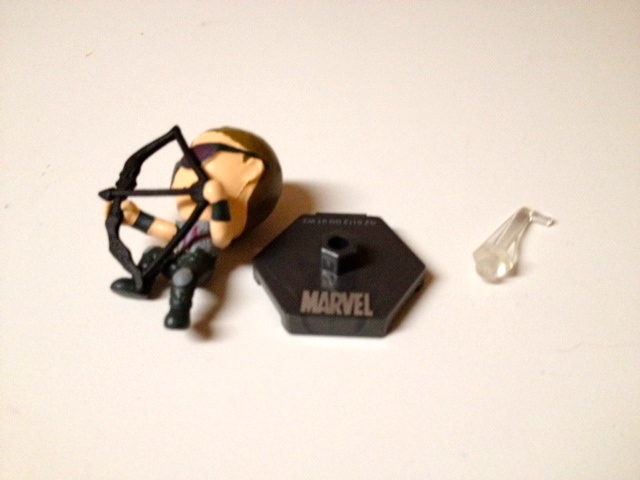 When you open the outer blind bag, the toy is in a second bag with a piece of cardboard wrapped around it to try to keep you from being able to tell what’s in the blind bag by feeling around. It’s not a very successful effort. 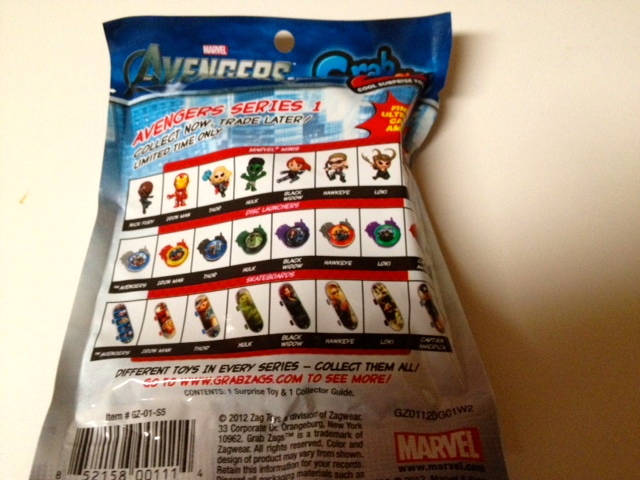 Each bag contains three pieces: the Marvel Mini, a base and a stand. 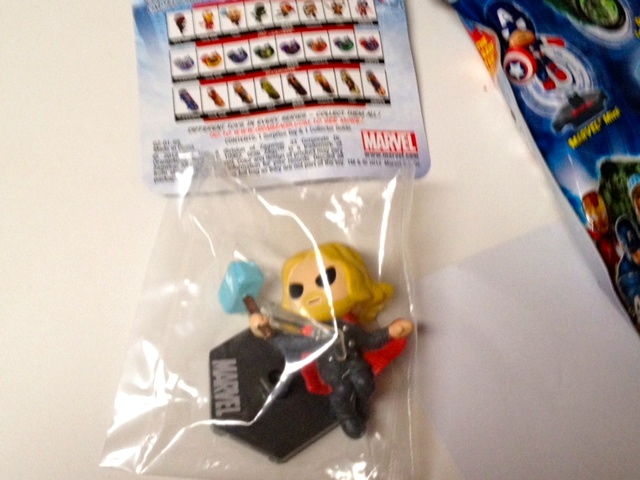 Of course with my luck the first bag I opened contained Thor and we all know he’s the worst. I like the cuteness factor of these figures. 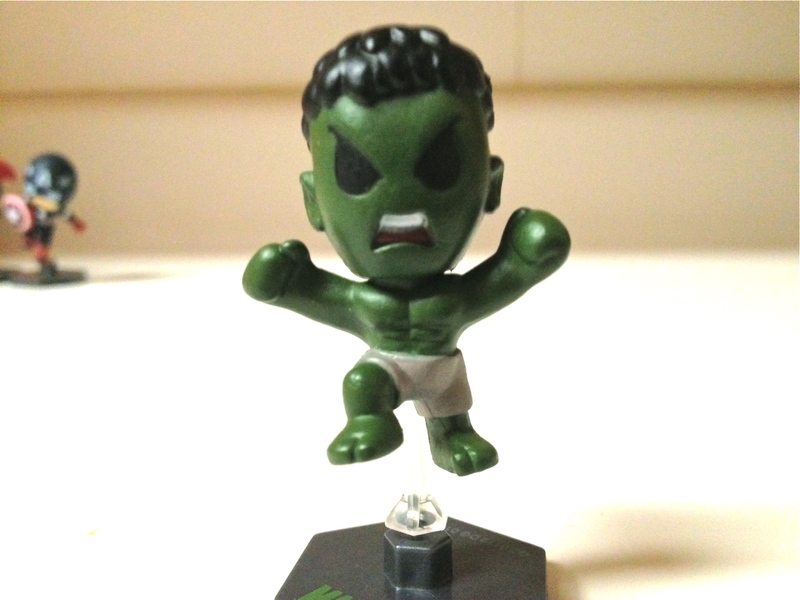 They are reminiscent of the far larger Funko Pop! 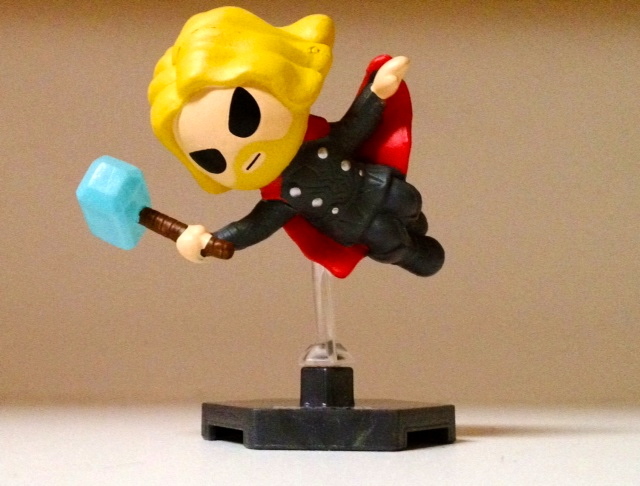 line in terms of the cuteness appeal, but the fact that Funko’s figures include so many different properties gives them the advantage in my opinion. 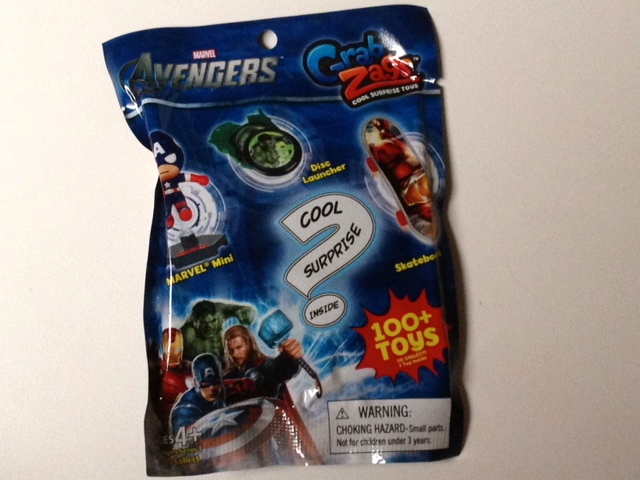 Also, compared with the Heroics mini-figures you get a tremendous increase in figure quality with Grab Zags for the extra dollar they charge. 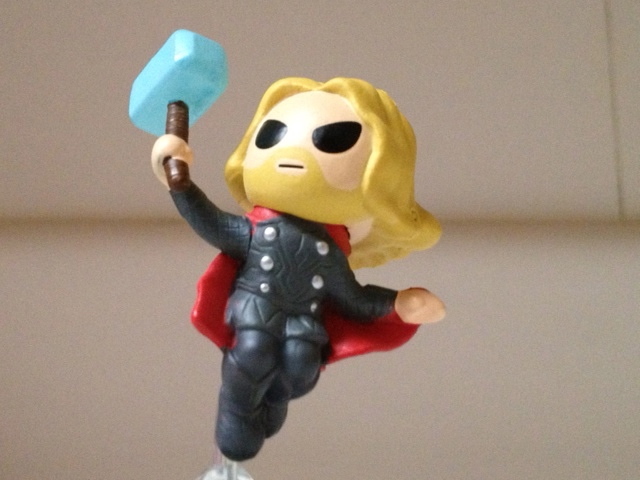 The one thing I really like about the Thor mini is that if you pose him flying at like a 45 degree angle, he basically looks like a Powerpuff Girl, which I find completely appropriate. With him posed completely vertically, he looks a little to regal for my taste. I’ve seen Grab Zags for sale at both Five Below and Toys R Us. At Five Below they sell for $2. A broader, separate Marvel non-movie line also exists. 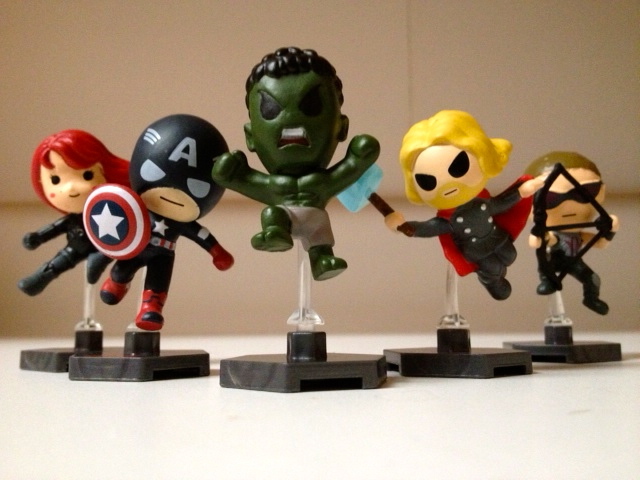 It seems many of the figures in the Avengers line are just slightly repainted versions of the Marvel ones. If you’re looking for characters like Spider-man, Wolverine, Green Goblin and Cyclops the broader Marvel line is for you. 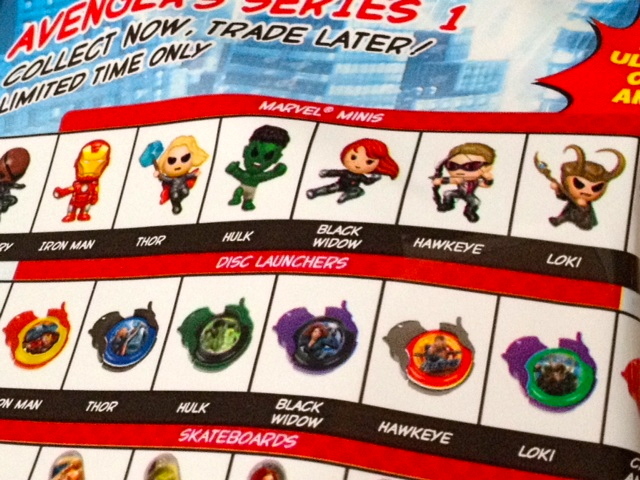 The other potentially blind boxed choices in that line are Marvel pens and mini flashlights rather than skateboards and disk launchers. There’s also apparently a line in support of the Ultimate Spider-Man Animates Series, but I’ve never seen them in person. It looks like the Utimate Spider-man series ditched everything, but the mini figures. A good decision if you ask me. 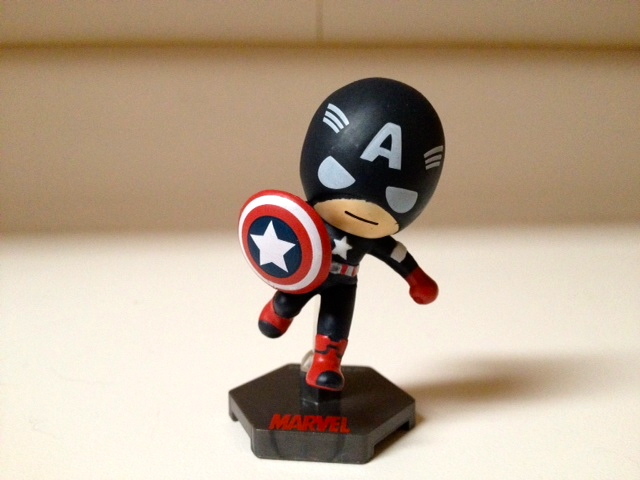 My favorite mini figure from the line is Captain America, mostly due to the perfect tiny shield. 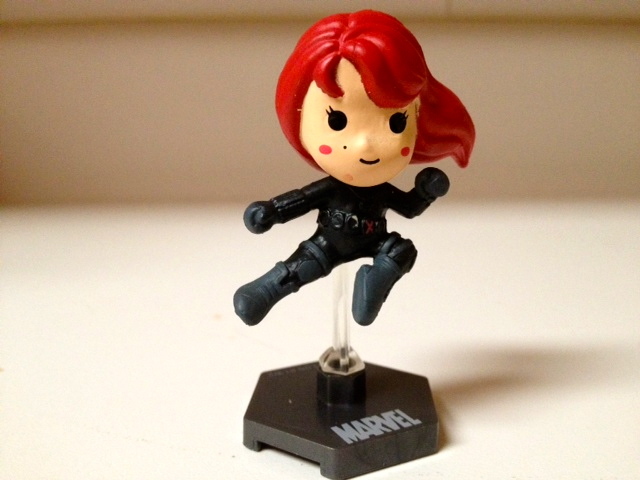 I appreciate that they gave Black Widow rosy cheeks and a cute beauty mark. 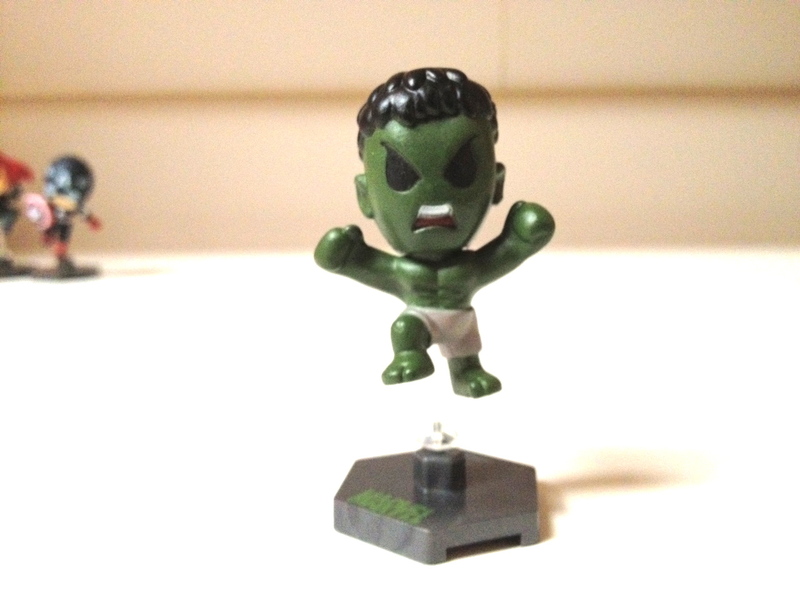 Even though Hulk’s color scheme is absolutely appropriate based on The Avengers movie, his skin just looks too dark and his pants are just too not purple for me to fully appreciate my favorite Marvel character. 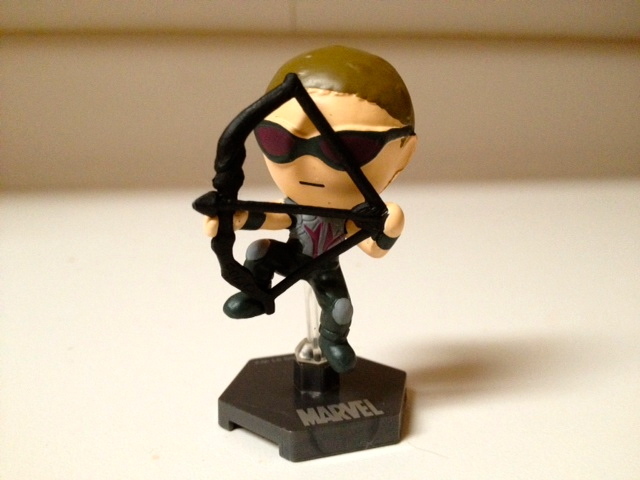 As for Hawkeye, the pose of his legs is just a little too goofy for him to be my favorite. 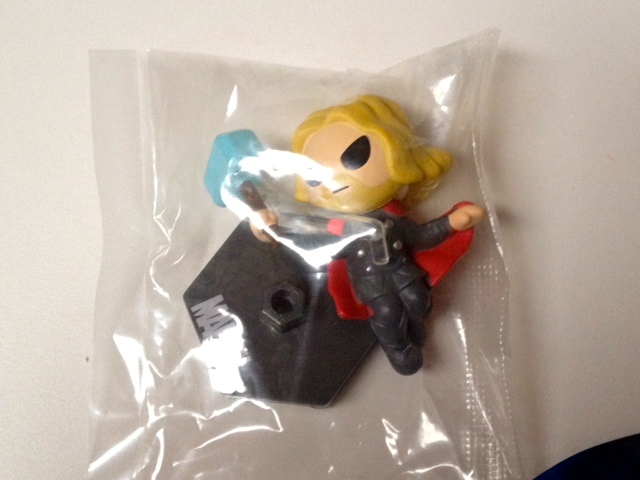 And of course, Thor is Thor and he stinks. I’ve never seen the other figures in the line in person.